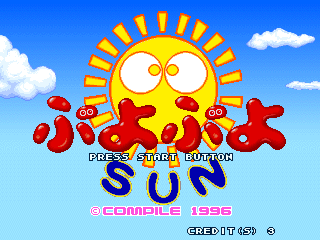 Puyo Puyo Sun (ぷよぷよSUN) is the third title in the Puyo Puyo series, initially released for Sega Titan Video arcade hardware in 1996. Like most Puyo Puyo games, Puyo Puyo Sun did not see a release outside of Japan. Like its prequel, Puyo Puyo Tsuu, the "Sun" part of the name is a pun on the number "San (三)", which is Japanese for "three" (in Puyo Puyo Tsuu, "Tsu" means both "Expert" in Japanese and sounds like the number "two" in English when spoken). Puyo Puyo Sun builds on the gameplay seen in Puyo Puyo Tsuu, however now includes "Sun puyo" - ojama puyo which will amplify the damage done to the player's opponent. The changes are otherwise subtle, but lead to a more combative game than its predecessor - trends that would continue in the Puyo Puyo games which followed. Puyo Puyo Sun introduces matches with as little as three colours of puyo in play. This changes the dynamic of the game significantly - fewer colours means popping occurs more often, and in turn, chains are easier to create, allowing for stronger attacks. With sun puyo then amplifying these attacks (the popping of one sun puyo can easily create a row of ojama), matches become less about careful placement of puyo in the field, and more about being able to counter your opponent before being flooded. In practice this means matches in Puyo Puyo Sun are generally shorter than Tsuu, as chaining is no longer a requirement for large attacks. It also means the weakest computer players in Sun have far more of a chance of winning than in Tsuu. The game's three difficulty settings are represented by different playable characters, meaning for the first time, player one does not need to be represented by Arle (or nobody). Each character also has its own complete set of voice samples (as opposed to Tsuu where the enemy only speaks its name and makes a noise when defeated). The game was brought to the Sega Saturn and Sony PlayStation (Puyo Puyo Sun Ketteiban (ぷよぷよSUN決定盤)) in 1997 with various extra features. It was also brought to the Nintendo 64 and Windows PC and a handheld version was released for the Nintendo Game Boy. Again, neither of these versions left Japan. In 2003, Sega rereleased the PlayStation version with a cheaper price. This version, SLPM 87213, is one of only two PlayStation games (the other being MiniMoni. Shakka to Tambourine! Dapyon!) released by Sega. In March 2014, Sega made the PlayStation version available to download from the Japanese PlayStation Network for the PlayStation 3, PlayStation Portable and PlayStation Vita. Main article: Puyo Puyo Sun/Magazine articles. Main article: Puyo Puyo Sun/Promotional material. P3_ABS.TXT TXT (Abstract) 321 About this game. README.DOC TXT 996 Messages from the developers. P3XB_ABS.TXT TXT (Abstract) 79 About this game.